There’s nothing like a few years of eating vegetarian to bring out the deepest seated affection for succulent steaks, burgers, bacon, and, of course, barbecue. I still like to distance myself from the whole this-is-the-flesh-of-a-real-animal thing but, then again, I always did even before I went vegetarian. In truth, I think the violence of eating is something that humans are alone in having to grapple with and it will always affect some more than others. It’s both the blessing and the curse of modern society that the majority of people in the developed world are detached from the way their food is grown. In the United States especially people don’t know and, I think, don’t really care where their food comes from. My turn to vegetarianism in college wasn’t really as deep and meaningful as all of that though. I eased into a vegetarian diet slowly. There were a lot meats (and meals made with meat) that I simply didn’t like the taste of. The ones I did tended to challenge my culinary talents to the point that the list grew smaller and smaller. Plus, meat is expensive. My trials in the kitchen and with becoming a financially independent adult coincided with an academic environment in which ethics, philosophy, and politics took center stage. And so, before long Luke and I decided we would be fine eliminating meat – – as well as our contribution to the bloody side of corporate agribusiness – – from our diet all-together. And we were. While we never intended to approach our new dietary choice like zealots, the surprising resistance to vegetarianism by a handful of family members and friends did imbue our lifestyle with a certain degree of fervor. And then, this last Spring after a long day’s work in the garden, we both ordered bacon cheeseburgers at The Cheesecake Factory like it was nothing at all. A very fitting turn of events given the nonchalance of our journey towards a meat-less diet years before. That was the spark too. Suddenly we craved burgers and bacon like it was no one’s business. We began a quest for the best burger in Durham and did our best to make up for all the cholesterol we had avoided in the previous 5 years. I still dislike the same meats as before. Pork? No thanks. Rib-eye steak? Nah, that’s alright. Carnival turkey leg? Umm, eww. But I digress. 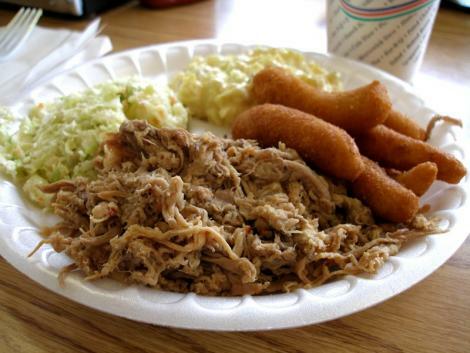 This post is about Texas barbecue. I. love. Texas. Barbecue. Yes, I had forgotten about it for a while there but the weakness is back in full force. Though I only discovered recently how important the Texas part is in Texas Barbecue. I’m a Texan and as far as I’m concerned barbecue means brisket. My understanding though is a regional one for sure because Luke didn’t even know what brisket meant. I’ve asked around at work too. Co-workers, customers, vendors… I’ve found a total of 2, yes two people who knew what brisket is. In case the picture doesn’t do it justice, let me say it looked gross. Very, very gross. Luke was all, “what did you get?? ?” with a great stink-eye expression. To be fair, it was edible… we got it once again a week later. Buttt, not exactly gooood…. and not what I would consider real barbecue. So, without my beloved Railroad Barbecue nearby, I had to take matters into my own hands. Its hard to make great brisket without a smoker or a grill but I found a great way to approximate the real thing in the oven. And because I believe in sharing the love, I’m gonna walk you through it here so that you can make your own. a 4 pound-ish beef brisket with a nice layer of fat about 1/4 inch thick. *This recipe can be easily expanded or reduced. 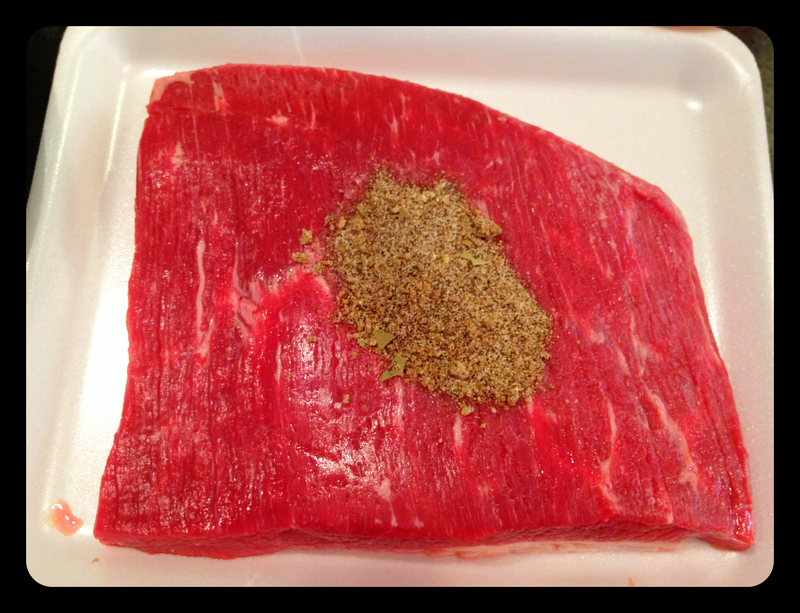 The photos below are from a 2.25 lb brisket I made the other night and just halved the other ingredients. 2. 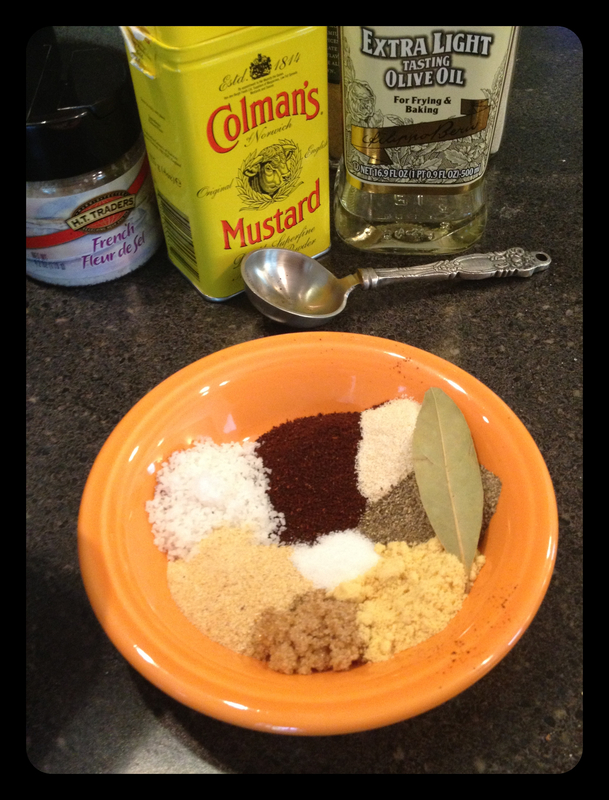 Make a dry rub by combining the first 11 ingredients (the cayenne pepper and oregano are optional). You can buy barbecue rubs in the store already mixed together but I think this combo not only tastes way better but is super easy too. 3. 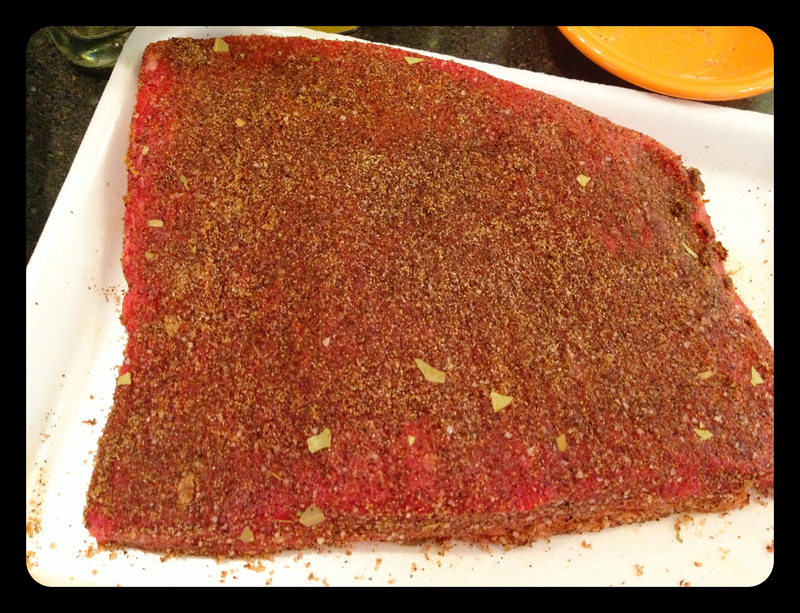 I like to rinse the brisket under cold water and then pat dry before rubbing it well with the spice mix. 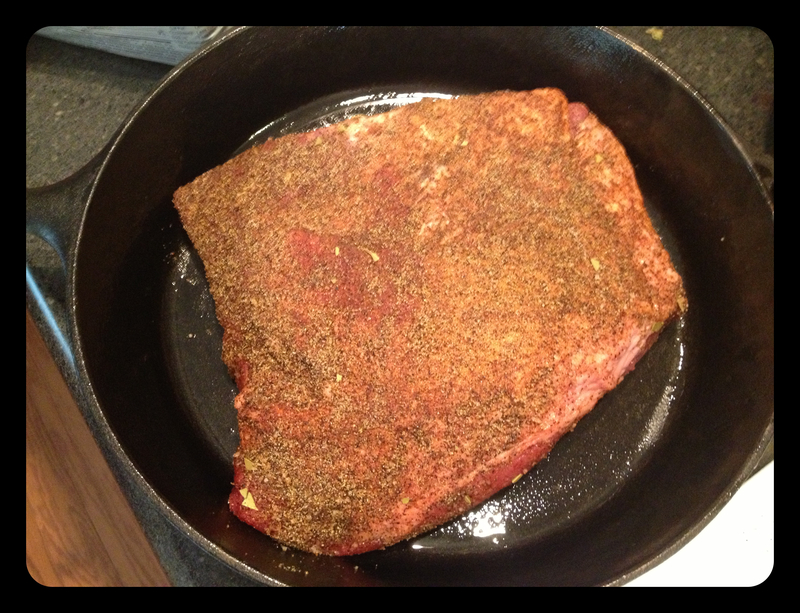 Be sure to season the brisket well on both sides and on the edges and use your hands to really massage it in. You shouldn’t have any of the rub left over. 4. Transfer the brisket with the fat side up to your cast iron dutch oven or skillet and roast in the preheated oven uncovered for 1 hour. 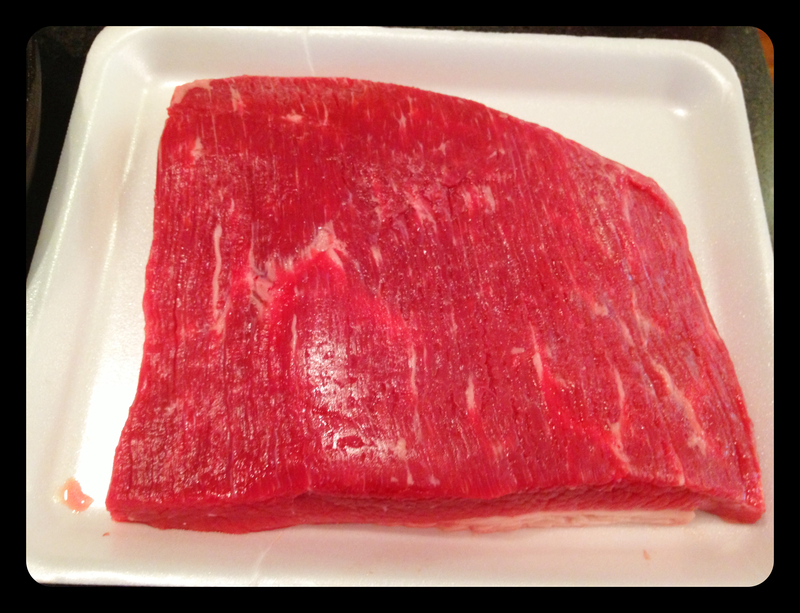 *The fat on the brisket is really important here because it not only gives the brisket a better flavor it keeps it from drying out while you cook it. 5. By now you’re going to be enjoying the most incredible aromas wafting from your kitchen. Add the beef stock (or beer) and enough water to fill the skillet or dutch oven with about 1/2-1.5 inches of liquid. Add the carrots, if using. (I usually toss in a handful of baby carrots because its easy.) Use a little less water if you’re not using carrots. Add the liquid smoke and Worcestershire sauce. 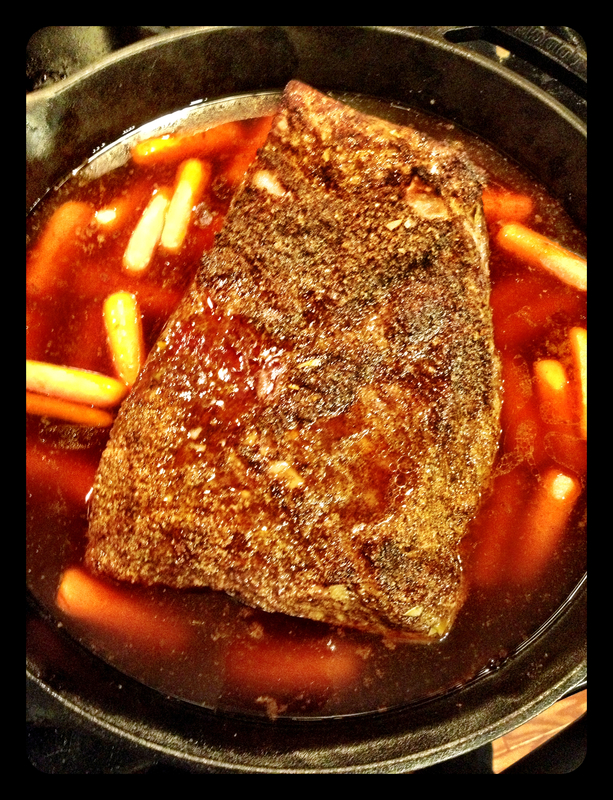 * Beef stock makes the brisket taste a little more like pot roast, beer gives it a slightly different flavor. I haven’t tried using wine yet but I’ve read that some people like to use beef stock and then substitute dry red wine for the water. 6. Lower the oven to 300, cover your cast iron with a tight fitting lid, and continue cooking for 3ish hours. At the 3 hour mark you’re probably good to go but if you’re not ready to eat yet just turn the oven off but leave the cast iron inside for however long. I’ve left it for a few hours and it was still ah-mazing. 7. I like to scrape the fat off the top before cutting and serving but its really up to you. Be sure to cut across the grain and top with some of the juice from the pan. 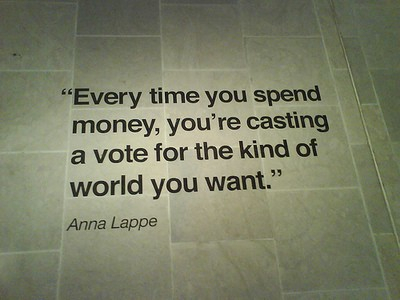 Surely you’ve heard the argument that with each dollar we spend, we cast a vote for the kind of world we believe in. Anna Lappe gets credit for the quote but I think the idea has surfaced often over the last few decades in various arenas of the public and academic sphere. I take issue with this line of argument in many ways. For one, it is dangerous to confuse voting with shopping. They are not the same thing, nor should they be. But more importantly, it evades the important question of what is placed on the ballot in the first place. To be clear I believe there is a place for ethical consumerism and that choosing more carefully where we spend our money can effect some degree of change. Buying local or buying green products helps to slowly expand the market for these kinds of items and perpetuates the values they derive from. Certainly boycotting a particular brand or product can similarly help to shrink a market and encourage alternatives. However, we cannot shop our way to better, more sustainable regulation and legislative action. Spending every Saturday morning at the farmer’s market doesn’t do enough to demand a change in factory farming practices. Outfitting your roof with solar panels, while a fantastic demonstration of conscience, doesn’t stop the coal industry from trudging on. And no matter how many times you eat lunch at Chick-fil-a, clicking your proverbial heels, you’re never going to walk back out into a world in which gay people don’t exist. Moreover, we cannot shop our way to less consumption. We can work to harness our waste, treat our property well so that it lasts as long as possible, and be a bit more discerning about our purchases making wastefulness a part of the criterion used for making ethical decisions while we shop. Still, if our desire is to vote with our money, we’re inevitably going to be forced to sacrifice some values in order to “stand up” for others. Not to mention, we’re going to be out-spent. That being said, it strikes me as significant that so many companies with merchandise for sale in our country find it acceptable to lie, deceive, and otherwise try to hide the contents of their products from the consumers who buy them. California’s proposition 37 has really brought this issue to fore in recent weeks. With corporate agribusiness exceeding $32 million in dollars spent fighting the initiative that would require genetically engineered foods be listed on product labels and that would forbid such products from being marketed as ‘natural’, one cannot help but shake their head at the state of our food industry. After all, the measure is far from oppressive allowing exemptions for alcoholic beverages, restaurant food, hospital food, and probably even school lunches. Our meat would still be packaged as usual – – no label changes for animals fed GM foods. No label changes for foods whose weight contains .5% or less of GM ingredients either. A rather approachable initiative, if anything I would argue it does too little, not too much. It is no surprise that Monsanto has taken the lead in opposing this proposition. The bigger surprise is the list of allies Monsanto has found in their information war. 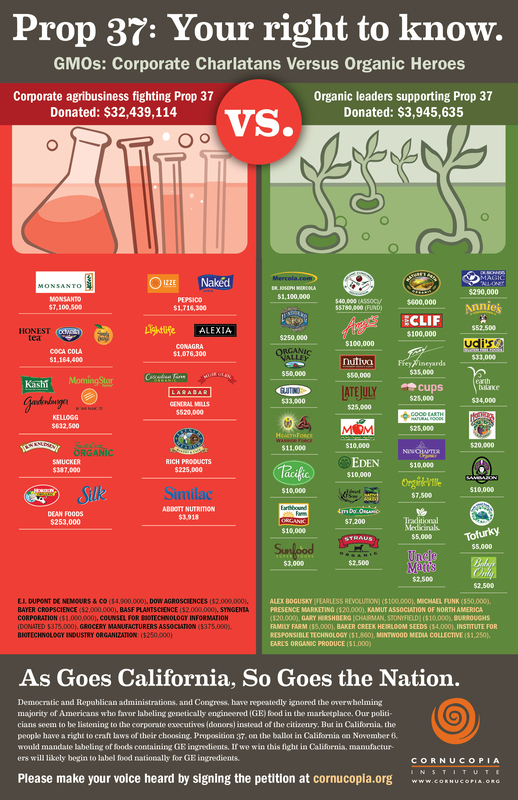 Rights of the consumer aside, people have a right to know what is in their food. We have a right to know what we’re eating, where it comes from, and how it was grown. There is a reason chicken farms don’t let folks stroll in and snap photographs. Its the same reason companies like Conagra, Dean Foods, and General Mills don’t want customers knowing what goes into their organic milk products and ‘natural’ granola bars. They’re not afraid of going out of business, they’re afraid of having to change their business practices. It is ironic that some on the far right can claim America is not business friendly. With all the corporate outcry against the costs new labeling laws would force upon them, the unaware citizen might be surprised to know that 50 countries around the world already require GMO labeling, including all of Europe, Japan, Australia, New Zealand, India, and China. Although the new labeling laws won’t go into effect until July 2014, I believe proposition 37 is an important step for our country. If the legislation passes in California, it will likely open up the gates for new labeling laws across the country. So, please, California: vote yes on Proposition 37. Stand up for our right to know.